Construction: Lots of Style and Storage! 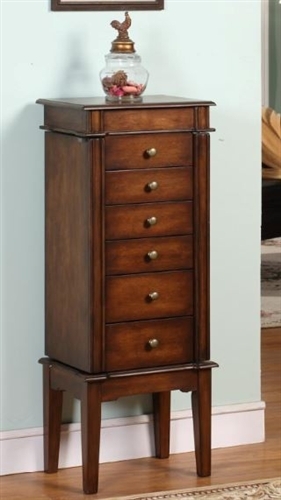 A beautiful mahogany jewelry armoire in a traditional design with brass handle pulls. Will blend with both traditional and modern decors. Six drawers of varying depths and long swing out necklace sides to house any jewelry collection and accessories, plus bedside delicates. Will last a lifetime! Quality Assurance 1 Year Warranty: This Nathan jewelry box has a one year warranty which covers manufacturer defect and inferior workmanship. If within one year of normal use it is found to be defective, please contact customer service with specific details about the problem and we will assist you with an exchange replacement from the manufacturer. Instructions vary by brand, please contact customer service for assistance with a warranty claim. 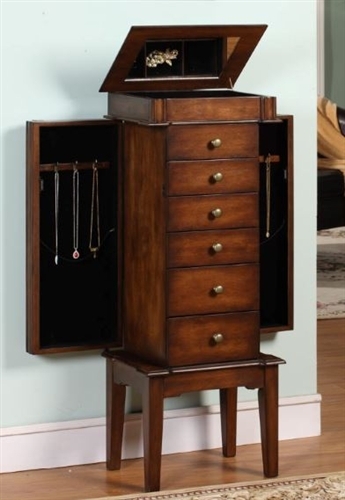 ChasingTreasure is an authorized dealer for Nathan Direct, manufacturer of top quality jewelry armoires and jewelry boxes. In business for over 20 years.